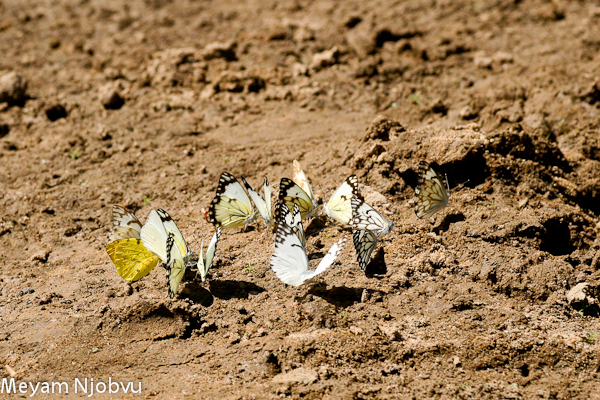 Everything is going well here in South Luangwa, as we are reaching mid-term, season-wise. We thought for a while that winter would end early, only to surprise us with extremely cold nights and mornings these past few days, making for chilly game drives. Sightings are quite spectacular. I think July can be best described as the cruel month this year, as we have witnessed a series of kills and surprising events. 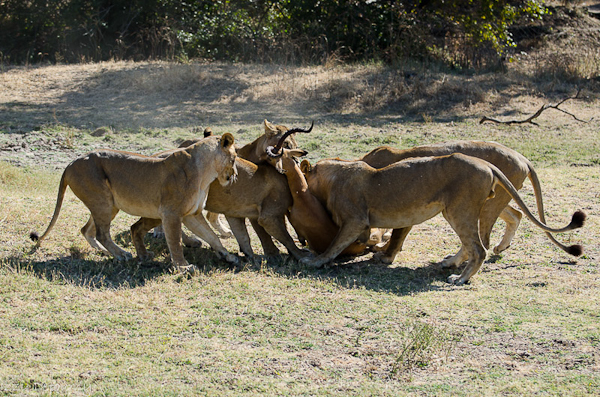 At the very end of June most of our guests, including a lucky me, were on the front row of the fastest lion kill I have had the chance to see so far. The Mwamba pride was strolling in the thickets around Mwamba camp following a large herd of buffalos, but eventually changed route to head for the waterhole. 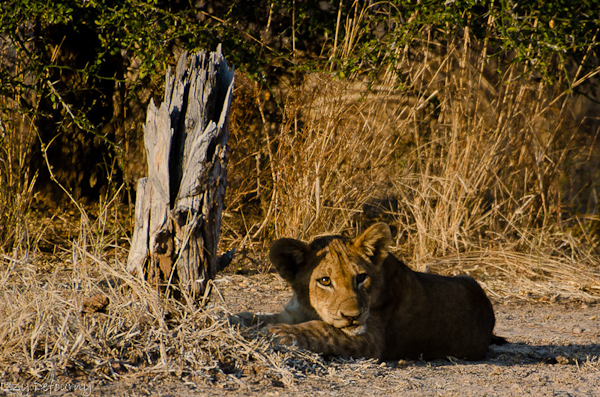 Meyam repositioned our vehicle on the other side of the thicket, anticipating that the lions would come out in front of us. 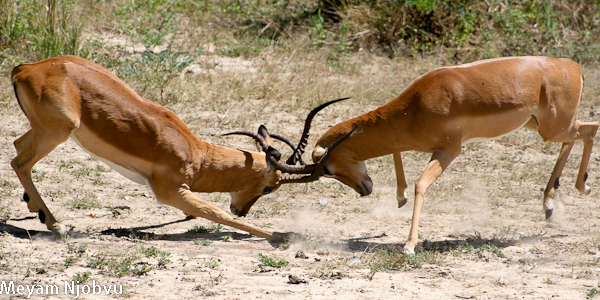 It was a quick alarm call of a male impala which signaled the arrival of the pride. 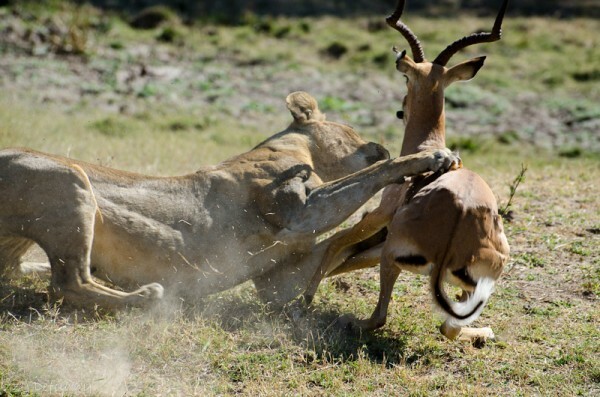 Bursting out of the bush, came the impala in full speed, chased closely by a lioness. It took a quarter of a second for my brain to register this, and then adjusting the camera in order to follow the chase, which continued for only a few meters. 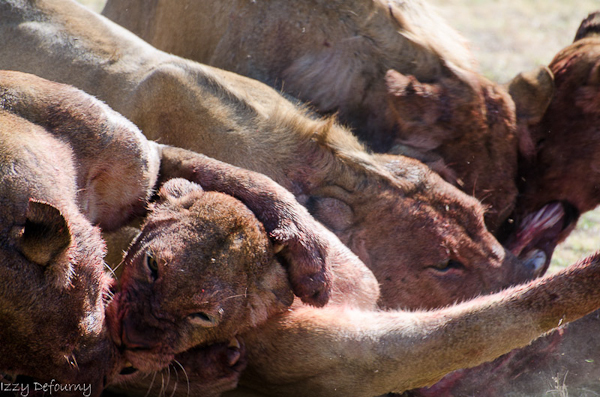 The lioness immobilized the impala, and was immediately joined by another 7 members of her pride – all hungry lions with a very small catch to feed them. 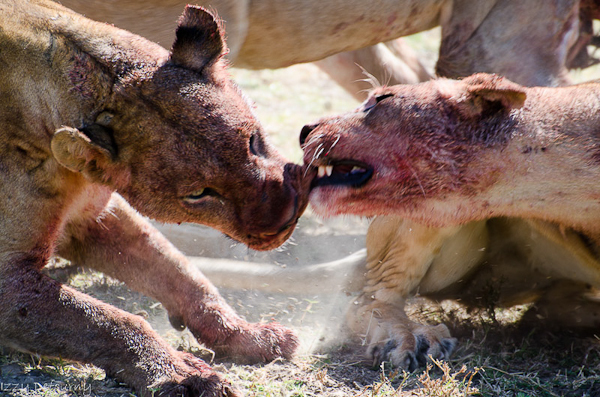 A very fierce battle followed, and in 6 minutes the meal was consumed. 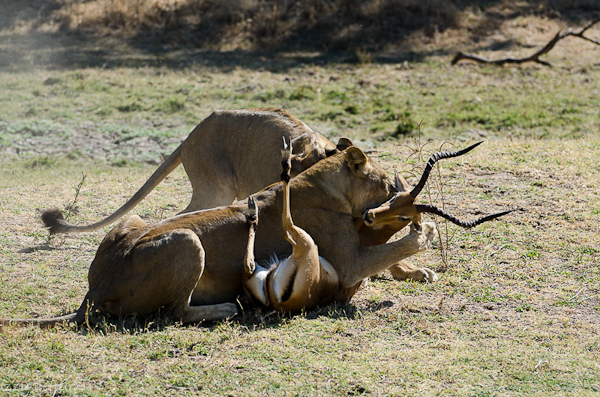 Two young male lions decided to have a tug-of-war with the horns of the impala, showing off the power of their muscles and voicing deep growling and grunting. 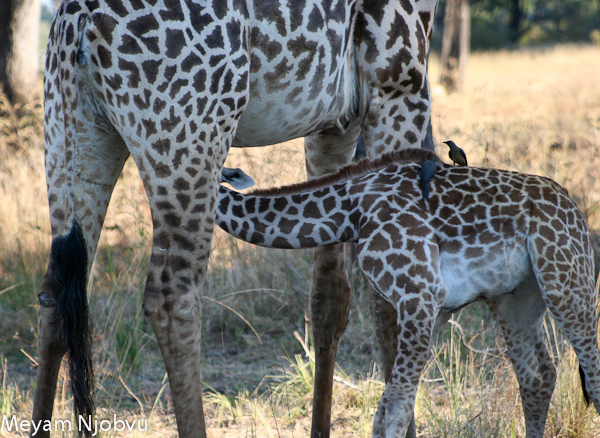 ” My wife Iris and I were at Mwamba Bush Camp with Kennedy as our guide. 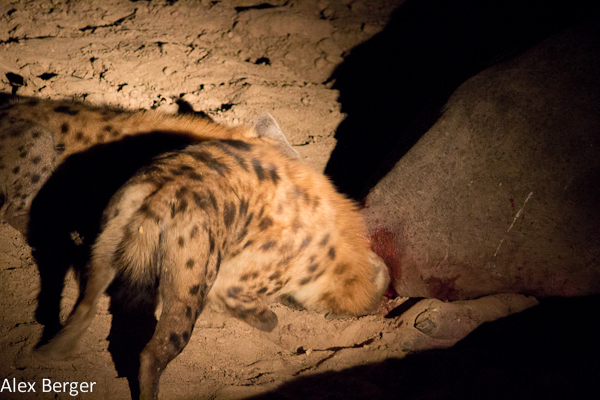 We heard a lot of hyena calls the night before and during tea the following morning with Kennedy we heard more hyena calls on the other side of the Mwamba river bed. We decided we should go and investigate further. 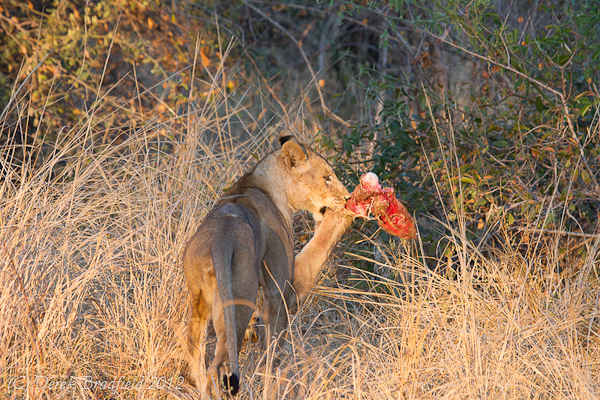 We came across somewhere between 12 and 15 hyenas squabbling over what we initially thought was the carcass of an impala or puku however when one of the hyenas tried to run off with the remains we realised to our horror that it was in fact a lion. 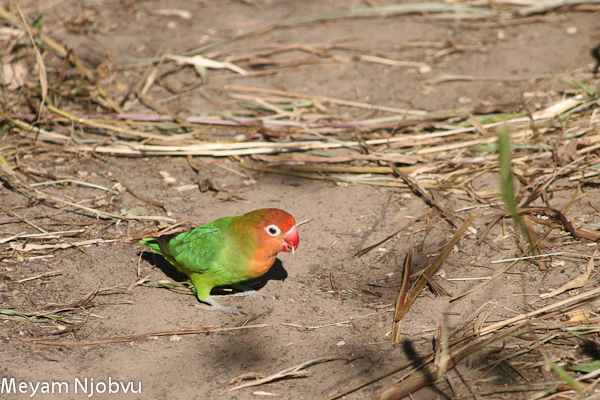 We assumed it had to be one of the group of 7 we had seen at the Mwamba waterhole the previous afternoon. 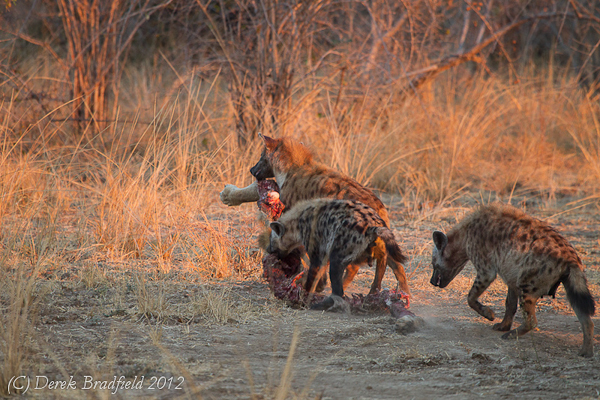 What we didn’t realise was that the other brother and sisters were still close by and they made repeated attempts to chase away the hyenas, with somewhat limited success. 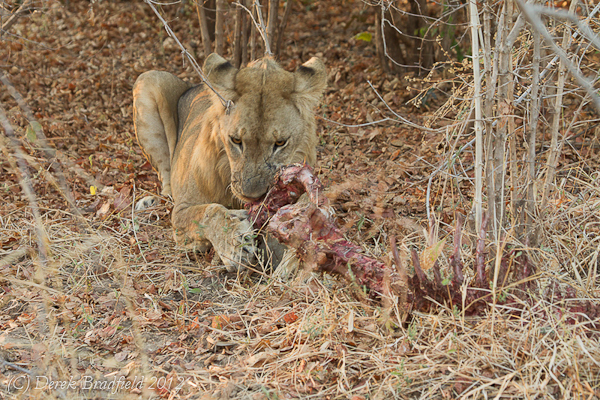 Eventually one of the lions managed to retrieve the carcass but to our surprise then started to nibble away at these remains. 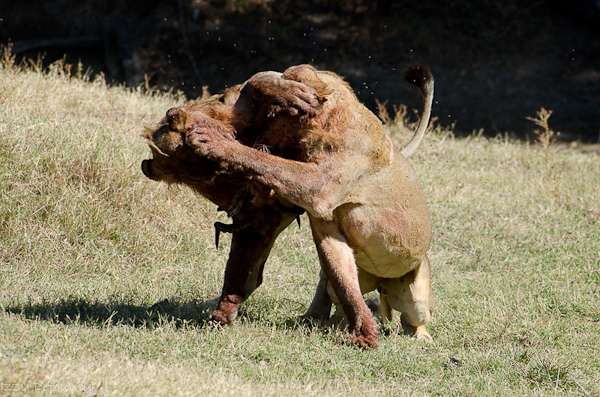 Not something any of us expected, certainly not Kennedy, who commented that he had never seen a lion eating another lion. 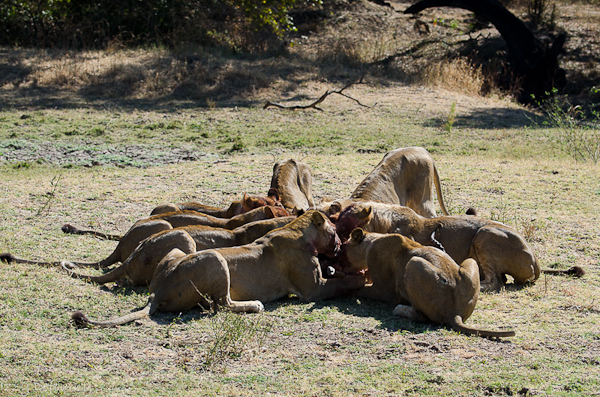 Eventually the lions lost interest and slowly moved away up the river bed leaving one of the hyenas to carry what was left of the male lion into the bush. 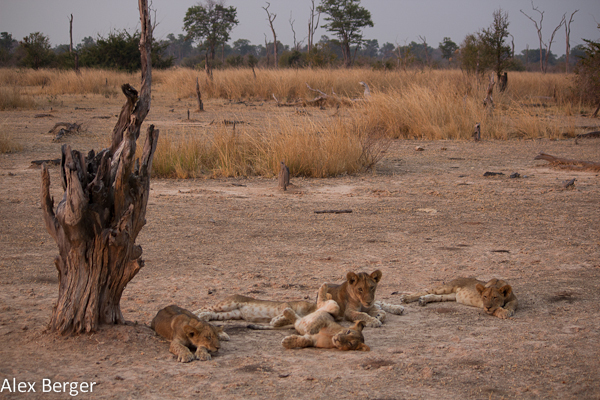 We discussed with Kennedy how the lion could have been taken down by the hyenas and the only possibility may be that it was injured during the night, possibly by a buffalo, or a fight between male lions, and consequently got separated from the rest of the group. 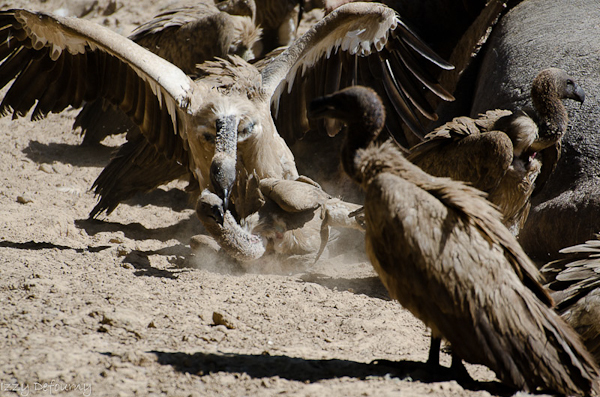 While this was a horrific site it just emphasises the cruel side of nature and survival of the fittest. 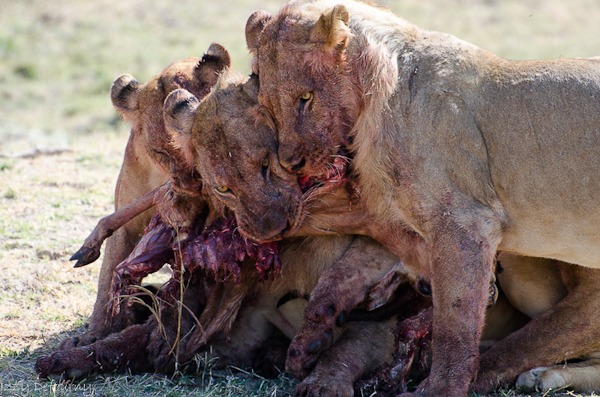 PS: we suspect that the dead lion, and the one seen here eating the remains are those same two male lions that were fighting over the impala head on the first story. We will never know what has exactly happen to that young male. 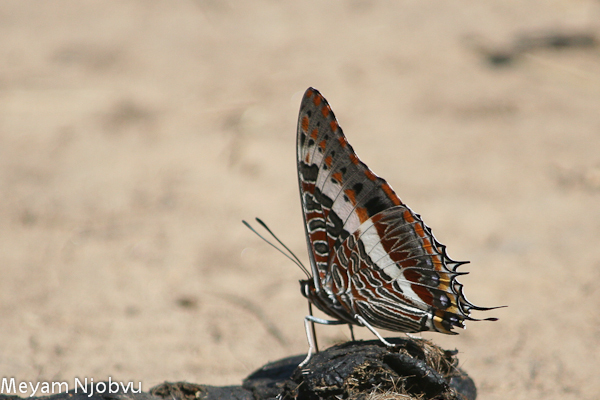 The mysteries of the African bush. To add to this series of gruesome sightings, about a week ago, our guide Sylvester was heading out for a morning transfer, and as he reached the other side of the ebony grove, he noticed a hippo with what seemed to be a broken hind leg. 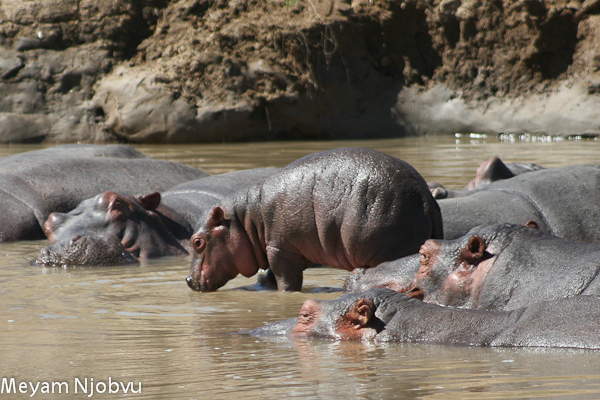 The hippo was trying to head back to the river, but his hours were counted. 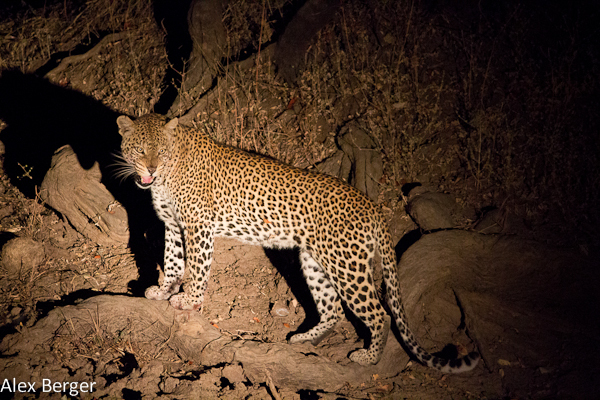 That same evening, Kennedy decided to check that area to see if the hippo had made it to the safety of the river, and came across a leopard with a bloody face, licking its paws and cleaning up. 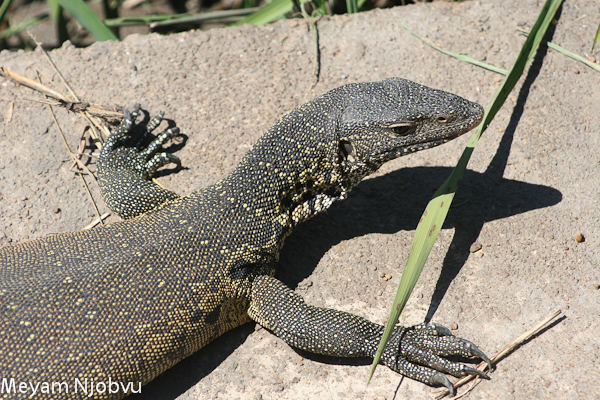 It appeared that he had been nibbling on the tail of the hippo which was by now immobilized in a gully. 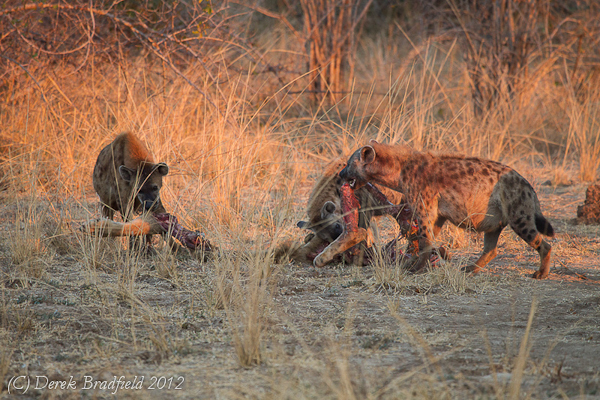 As the guests were looking at the leopard a small group of hyenas came and also went for the rear of the hippo. 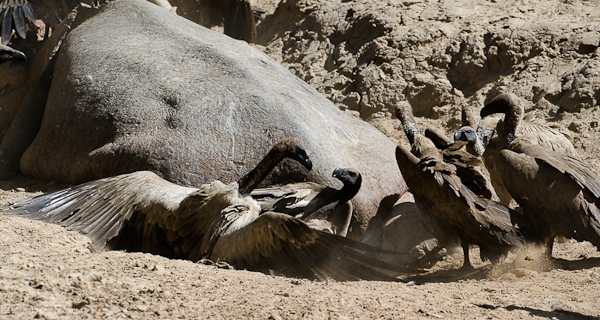 It would have been a few more hours before the hippo gave up on life. 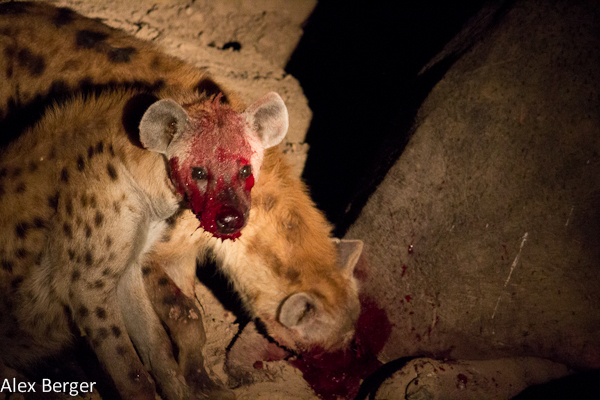 By morning at least 11 hyenas were on the carcass, followed by 30 or so vultures. In two days, any trace of that hippo was gone. The Hollywood pride is still extremely elusive, with only a few more sightings of random members of the pride. We suspect that they may have some cubs in hiding but we haven’t been able to locate them, only the lactating mothers have been seen. 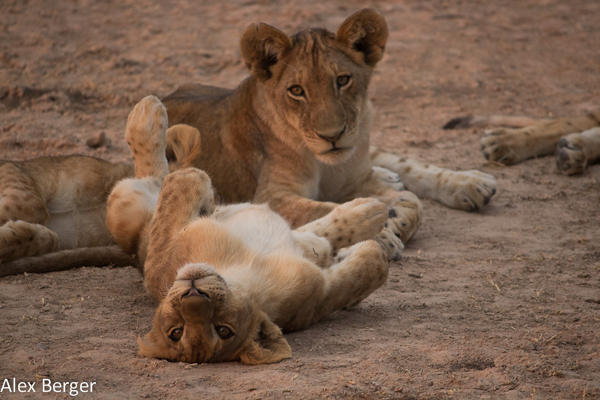 On the other hand, the cubs from the Mwamba pride have been playing models again to the great pleasure of our guests; they are growing up nicely in size. 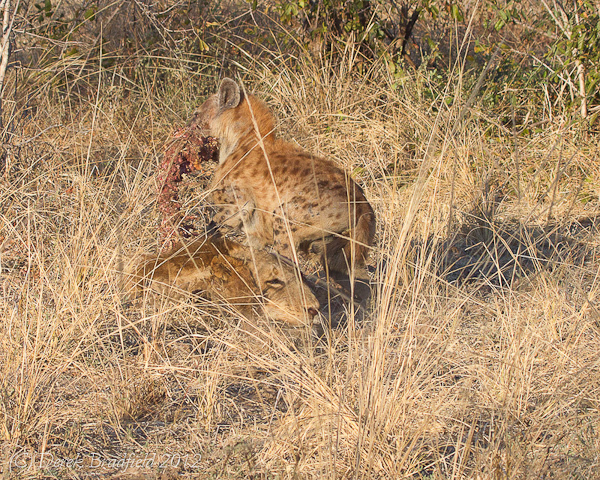 Travel blogger Alex Berger and his family were with us for five nights, and Alex has left us a few pictures for you to enjoy (including the above ones of the leopard and hyenas on the hippo). Alex is still travelling in Africa for awhile. In the meantime you can check his website www.virtualwayfarer.com and visit again in a few weeks when he will have had a chance to write more about his first safari in Zambia! 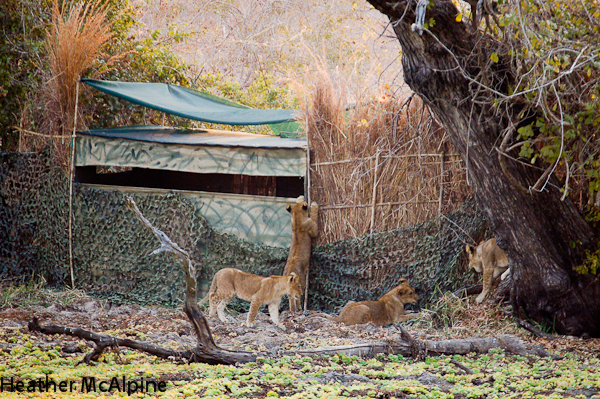 No later than this morning, Meyam and his guests find the five mischiefs destroying the mobile hide that was at Wild Dog Lagoon. They were caught right-handed by our guest Heather McAlpine. 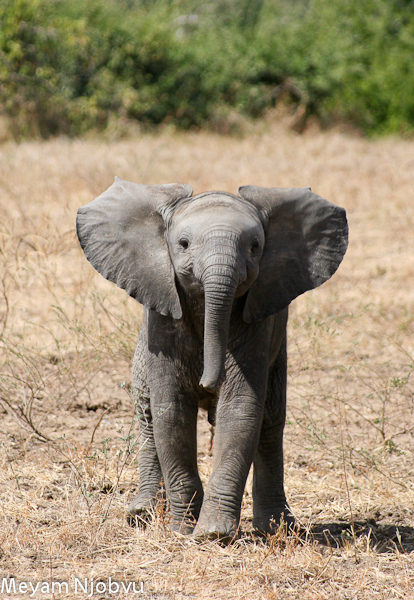 Elephants are starting to cross a bit more regularly near our Ellie Hide. 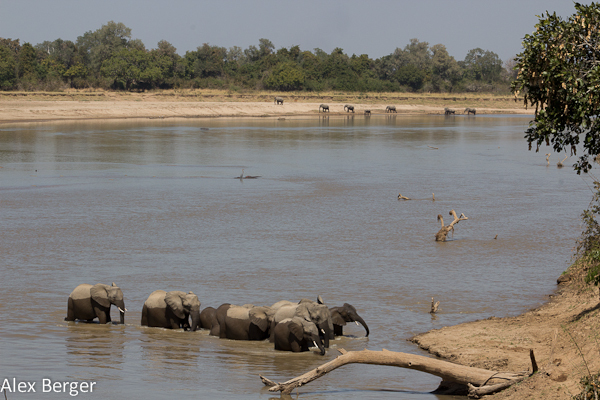 The river this year has created a deep channel on the western side, which seems to refrain ellies from crossing, especially that many herds have very young babies tagging along. 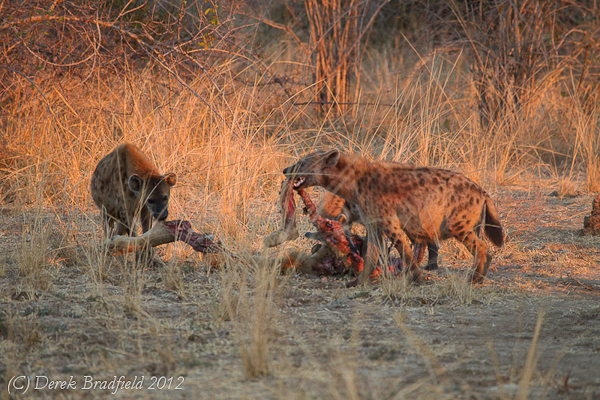 Last month we featured a few pictures from our guide Patrick. 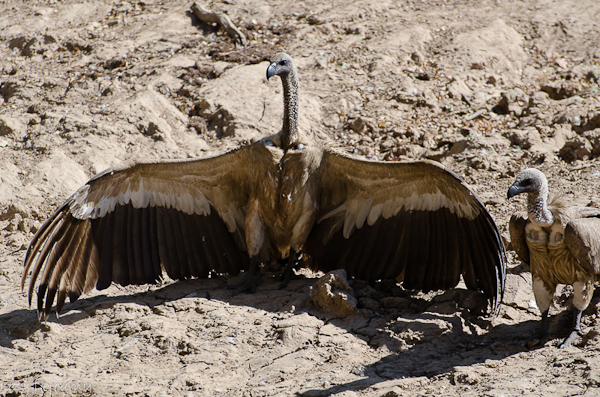 This month we are sharing a few of Meyam’s pictures, as he is proving to also be a quite keen photographer. I have only had the chance to skim through half of Meyam’s photographs so far! Jules and the girls have spent over a month here at Kaingo, and just made it back to Lusaka. We are expecting another visit in mid-August. Derek in the meantime is heading to his 30 years reunion in South Africa! Wishing you lots of fun boss! 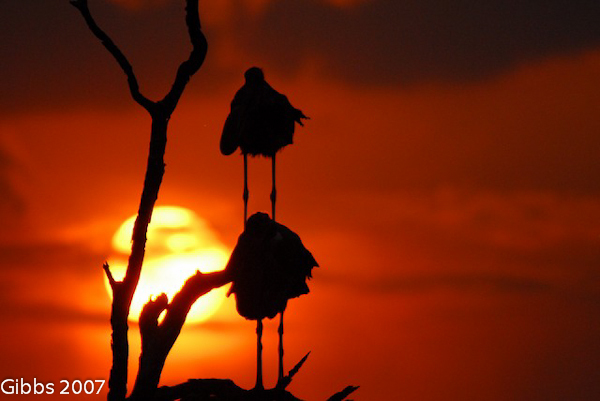 And finally, we are ending this newsletter with the winning photographs of our Picture of the Month competition. 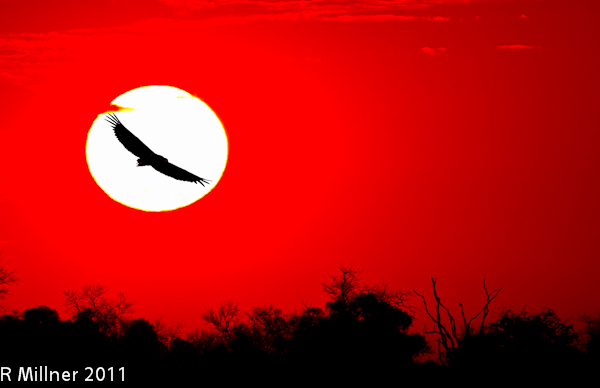 The theme for July was Luangwa Sunset. Congratulations to David Cox, Lisa Gibbs and Russell Milner for their inspiring images. That is it for me for now, and till later in August. 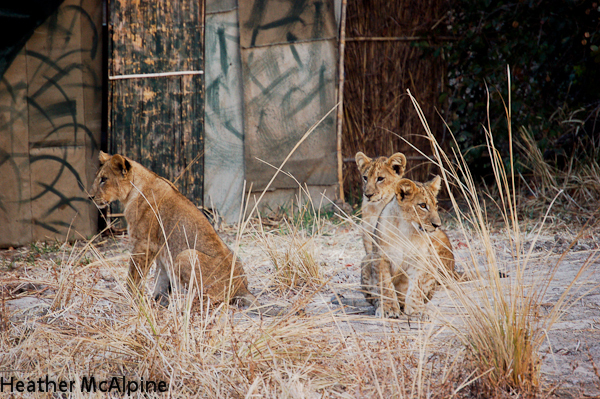 PS: as I am posting this, the Mwamba pride has given us another rarely seen sighting… but stay tuned… for our next newsletter! 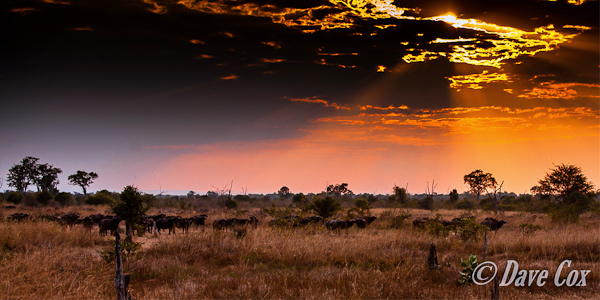 Our theme for July was Luangwa Sunset. Settings. Canon EOS 5D Mark II, 1/2000sec at f/4.0. Focal 70mm. ISO 800. 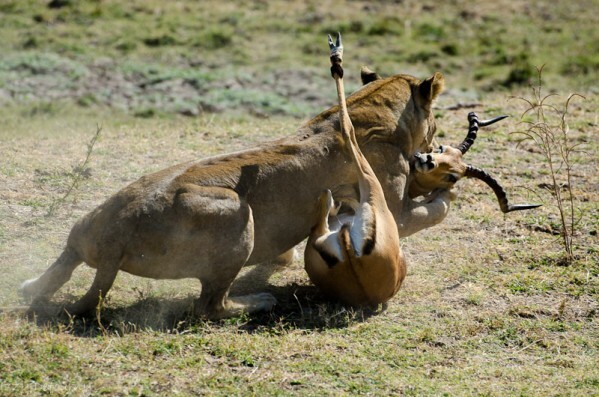 “We work in the veterinary field in the UK, and had previously travelled, particularly in Southern Africa, in search of more exotic wildlife. 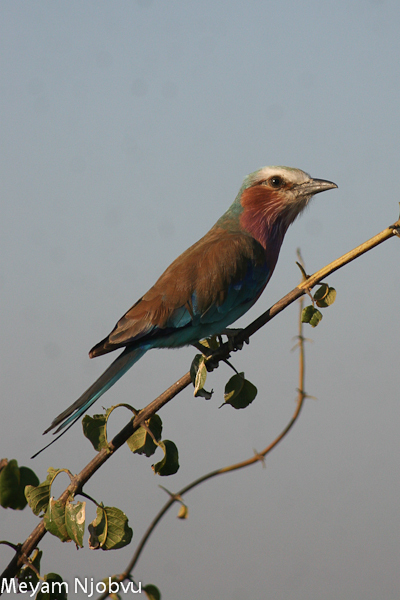 All those we met who had visited the Luangwa valley, raved about it. 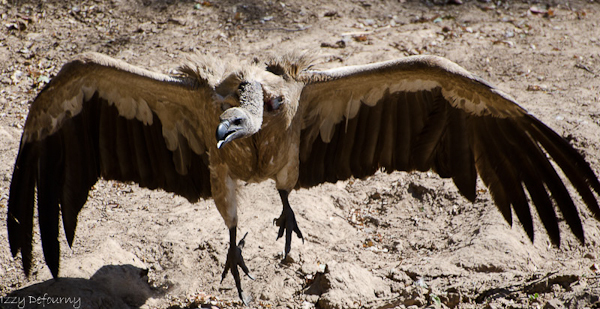 In 2007 we changed from film to digital in anticipation of our visit to Zambia. We chose Kaingo (equipped with our newly purchased DSLRs), attracted in part by its reputation for catering for photographers, and were not disappointed. Settings: Nikon D200, 1/4000 sec at f/6.3. Focal 500 mm. ISO 800. 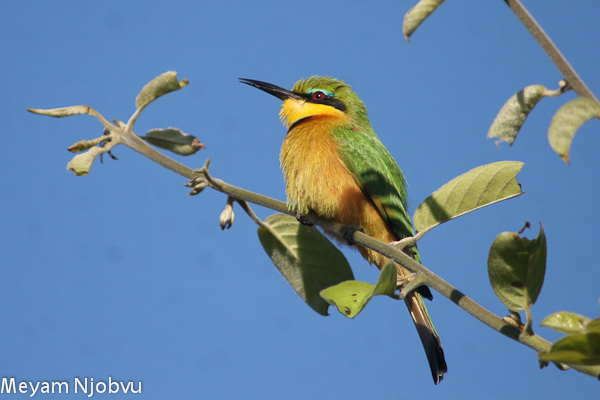 Settings: Canon EOS 7D, 1/500 sec at f/5.6. 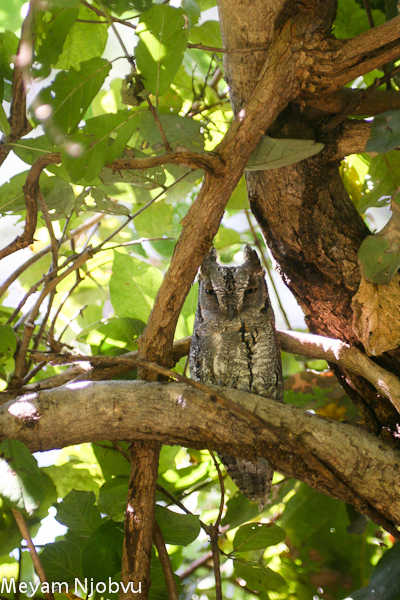 Focal 400 mm. ISO 200.